In New Jersey family court cases concerning child support payments, you may represent yourself. To initiate the process of seeking court-ordered child support payments, you will need to file a uniform support petition. This document can be found on the website of the New Jersey Courts. New Jersey Uniform Support Petition 11094 Step 1: Give your full name and Social Security number, as well as that of the person you are seeking support from. If your case has an IV-D status, indicate this with a check mark. Include all related IV-D case numbers and tribunals. New Jersey Uniform Support Petition 11094 Step 2: In section I, give the full names, dates of birth and Social Security numbers of all children you are seeking support on behalf of. New Jersey Uniform Support Petition 11094 Step 3: Indicate with check marks whether you have attached an establishment of paternity, an establishment of order for some form of support or legal costs and fees related to divorce, modification of a support order, determination of controlling order and arrears reconciliation, or some other document. If so, write what it is. New Jersey Uniform Support Petition 11094 Step 4: In section II, give the date on which the respondent stopped paying support if applicable. Place check marks next to all situations that apply to your case. 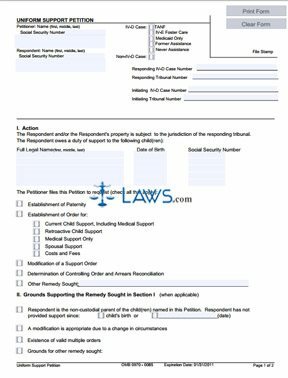 New Jersey Uniform Support Petition 11094 Step 5: In section III, indicate any additional supporting evidence you are submitting with your petition, such as a birth certificate for your child or acknowledgment of paternity. New Jersey Uniform Support Petition 11094 Step 7: Sign and date the form in the presence of a notary public or court official. Your attorney, if any, should also sign the form and include their bar number.